Earlier this month, we reviewed “Early Times in Pekin and Tazewell County,” an essay written by Pekin’s pioneer historian William H. Bates and published in Shade’s Monthly, May 1913 (reprinted in the Tazewell County Genealogical & Historical Society Monthly, June 2017, page 1945). Pekin’s first riot in 1851 is said to have been the fault of about 30 or 40 drunken deckhands of a steamboat. 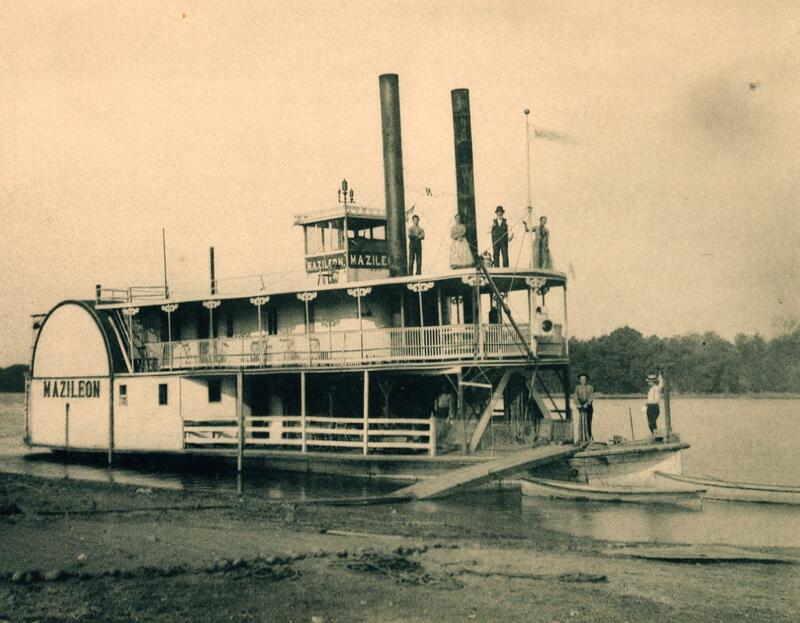 Shown here at Pekin in this photograph that Henry H. Cole took circa 1890 is another later Illinois River steamboat, the Mazileon, whose deckhands were not, as far as we know, responsible for any riots. It apparently was the same riot that Pekin old-timer Emil Schilling remembered in a newspaper article published in the July 24, 1933 Pekin Daily Times. In June 2013, this column discussed that article and Schilling’s 1933 recollections of the riot and the punishment that the court imposed on the rioters, whom Schilling said were black (a detail not mentioned by Bates). 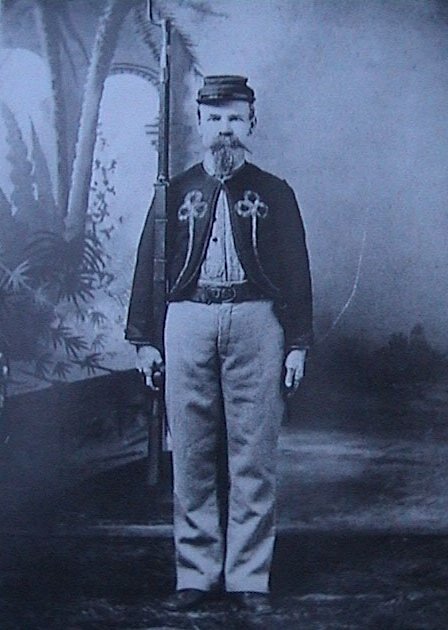 Schilling believed (whether rightly or not) helped to foster Pekin’s reputation as a place where blacks were unwelcome. Teepees along the railroad tracks? Here’s a chance to read one of our old Local History Room columns, first published in December 2011 before the launch of this blog . . . 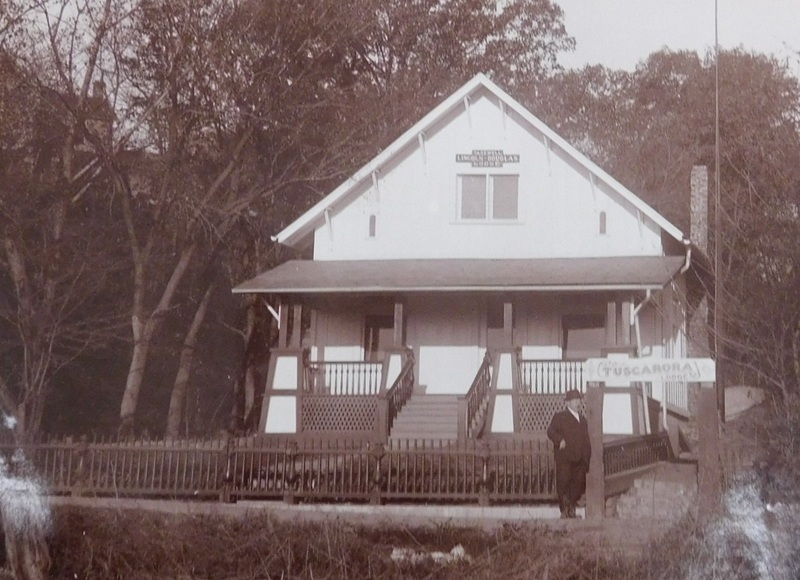 This week we’ll revisit a few recent “From the Local History Room” columns as we see what we can learn from a copy of a vintage Pekin photograph on file in the library’s Local History Room. The photo is remarkable because it shows a long row of teepees or wigwams between some railroad tracks. The copy of this photo, a halftone image, was clipped from a newspaper or magazine, and is accompanied by a caption that informs us that the photographer was none other than Pekin’s own Henry Hobart Cole, whose life we have reviewed in this column previously. In this vintage photograph taken by Henry H. Cole (1833-1925), a row of wigwams stretches northward between the railroad tracks in an area of northwest Pekin just to the west of Second Street. The caption does not say when Cole took the photograph, but several clues both in the photo and the caption help us to narrow down the period when it was taken. These clues also show where the photo was taken, and suggest who placed the wigwams in that unlikely location – or rather, who didn’t place them there. By consulting some of the library’s old maps of Pekin and tracing the rail lines, we can see that the foreground of the photo shows the area where Second Street and Market Street used to intersect – today that stretch of Market Street is a bicycle path. The row of wigwams appears to start around the area of Catherine and State streets. Obviously the wigwams were not actual Native American dwellings — no one can live in the dangerous plot of ground between two lines of rail. Also, as mentioned in previous columns, Pekin’s Indian population was deported to Kansas in the mid- to late 1830s, while the railroad did not come to Pekin until 1859. These wigwams, rather, indicated the area of Pekin where an Indian village formerly was located. Perhaps they were a display for a community fair or celebration. Gas lights were installed on Pekin’s streets in 1866, so the gas works were constructed by that year, which means the photo can be no older than 1866. 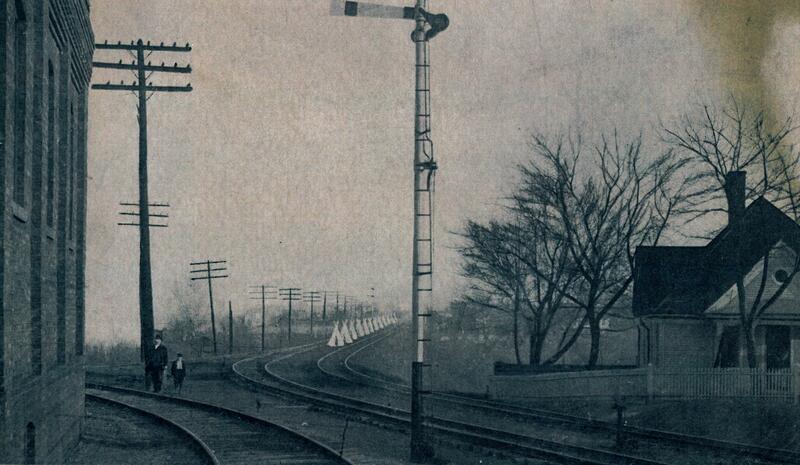 Similarly, the caption’s reference to “the Peoria & Pekin Union Railway” suggests a date no earlier than 1880, the year that railroad company was incorporated. An 1877 aerial “View of Pekin Ill.” in the Local History Room collection depicts the area shown in this photo, including the frame house on the right and the large brick structure on the left. Both the 1877 aerial view and the photo show an overall absence of houses and industrial or business structures in that part of Pekin. Cole went into semi-retirement in 1911, but we would expect to see more buildings in the photo if it was taken that late in his career. From what we’ve seen, it seems most likely that Cole took the photo during the 1880s or perhaps the 1890s. Pekin’s first street fair opened on Oct. 12, 1898, and a second street fair ran from Oct. 11-14, 1899. Could these wigwams have been an attraction at one of those fairs? Here’s a chance to read one of our old Local History Room columns, first published in April 2012 before the launch of this blog . . .
“Cole’s Souvenir” served as a memento for visitors to Pekin and a way to promote Pekin as a good place to live and do business – and, of course, also helped to promote Cole’s own photography business. But for us today, it is a memento of days long gone, granting glimpses of Pekin homes and businesses as they appeared in 1899. Many of them no longer exist, but others are still around, with new families or new businesses in them. For the past two weeks, we’ve spotlighted some items from the trove of William H. Bates papers recently donated to the Tazewell County Genealogical & Historical Society. This week’s column will feature one more fascinating item from the Society’s Bates collection – an old bound daybook in which are enrolled the names of early Tazewell County settlers. Several daybooks or diaries were included in the donated trove of Bates papers and photographs. Some of Bates’ daybooks recorded the activities and minutes of Civil War veterans groups to which Bates belonged. However, Pekin’s pioneer historian used one particular daybook to maintain an extensive alphabetized list of names that seems to have served as something of a personal directory of Tazewell County’s pioneers. David Perkins of the TCGHS has generously supplied photocopied pages from this daybook to the Pekin Public Library’s Local History Room, and the Society also plans to present the contents of the daybook in the TCGHS Monthly. The daybook is 12 inches long and 6 inches wide. The names are handwritten on 146 pages of the daybook, the pages numbered from 10 to 155. Most pages are completely filled up with 33 names each, but other pages have only 10 to 20 names, and a few pages have only about five names. Each line entry consists of the settler’s name, the state where he or she was born, the town where the settler’s post office was located, the year the settler arrived in Tazewell County, and the year of death if the settler had passed away. The most recent deaths recorded in the daybook happened in 1907, which therefore apparently would be the last year that Bates updated this list of settlers. Most of the settlers in the daybook presumably were still alive in 1907, for they have no date of death. In almost all cases, if a death is written in the daybook, it is only the year of death, but a handful of times Bates included the exact date of death. 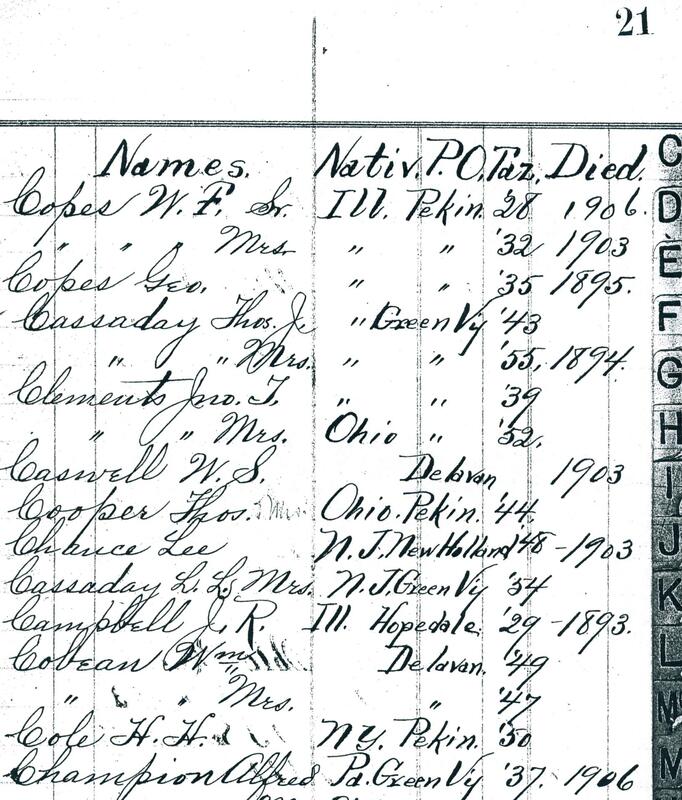 Because Bates’ daybook is from a period prior to Oct. 1914, when the Pekin Daily Times microfilms begin, the death dates written in the daybook can provide genealogists with information that may otherwise be unavailable due to a missing obituary or a missing or illegible gravestone. We can’t be sure of the reason Bates maintained this list of Tazewell County settlers. It’s quite possible that he did it as part of his own endeavors in recording the history of Pekin and Tazewell County. He may also have relied on this and similar rolls of settlers in researching or updating the annual Bates City Directories that he printed and published. One might also wonder if this tally of settlers’ names was related to the Tazewell County Old Settlers social organization. The 1873 “Atlas Map of Tazewell County” and Allensworth’s 1905 “History of Tazewell County” include the names of the Old Settlers who belonged to that club. If Bates’ daybook has something to do with the Old Settlers, it could be a membership list that was regularly updated. On the other hand, it does not give the appearance of being a membership register, for it doesn’t include information such as length of membership or payment of dues. Whatever the reason Bates kept this book of settlers’ names, it is now a precious historical relic and an important early source available to historians and genealogists who make use of the services of the Tazewell County Genealogical & Historical Society – or who make use of the library’s Local History Room collection.